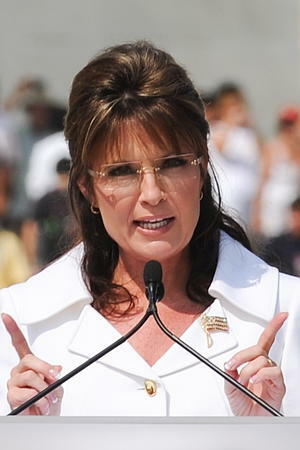 Former Republican Vice Presidential Candidate Sarah Palin speaks at the "Restoring Honor" rally at the Lincoln Memorial in Washington on August 28, 2010. Even as Sarah Palin’s public voice grows louder, she has become increasingly secretive, walling herself off from old friends and associates, and attempting to enforce silence from those around her. Following the former Alaska governor’s road show, the author delves into the surreal new world Palin now inhabits—a place of fear, anger, and illusion, which has swallowed up the engaging, small-town hockey mom and her family—and the sadness she has left in her wake. Track Palin sits with Willow Palin while holding Trig Palin on day three of the Republican National Convention (RNC) at the Xcel Energy Center on September 3, 2008 in St. Paul, Minnesota. FAIRBANKS — Former Alaska Gov. Sarah Palin has made a rare public appearance since leaving office. Anchorage television station KTUU reports Palin attended a ceremony in Fairbanks on Thursday to welcome home the 1st Stryker Brigade. Palin’s son, Track, is a member of the brigade, which recently returned from a yearlong deployment to Iraq. Also at the ceremony was Gov. Sean Parnell, who succeeded Palin upon her resignation July 26. Since quitting, Palin has been writing her memoirs. The former Republican vice presidential candidate’s book, “Going Rogue,” will be released Nov. 17. A memorial unveiled Wednesday at Fort Wainwright bears the names of 12 soldiers who died in the yearlong deployment. Seven were stationed at Fort Wainwright and five were attached to the brigade. Former Alaska governor Sarah Palin is presented flowers by Staff Sgt. Yvonne Smith on Thursday, Oct. 8, 2009, during the redeployment ceremony for the 1st Stryker Brigade Combat Team, 25th Infantry, in the Carlson Center. Palin’s son, Track, is a member of the brigade, which recently returned from a yearlong deployment to Iraq. Commander Col. Burt Thompson honored Palin with the flowers sayin she is a distinguished member of the brigade and senior mom. Sitting next to Palin is Walter Eggleston, whose son Pfc. Cody Eggleston was killed in Iraq during the deployment. FAIRBANKS — After a yearlong deployment to Iraq, it’s the little things about being back home that matter most to members of Fort Wainwright’s Stryker brigade. “The first thing I noticed when I got off the plane was the smell, the smell of pine trees and fresh air,” Lt. Sean Raleigh said. The personnel officer spent only a couple of weeks in Fairbanks before he was shipped off to Iraq with the 1st Stryker Brigade Combat Team, 25th Infantry. He said he plans to take in all Alaska has to offer during his next few weeks of leave time. Raleigh is just one of the more than 4,000 men and women in the brigade who were welcomed back to Fairbanks on Thursday during a redeployment ceremony at the Carlson Center. Track Palin Involved in Vandalism Rampage – Real Reason for Army Enlistment? Former Alaska Gov. Sarah Palin holding Trig Palin as her son Track Palin and daughters Bristol, Willow and Piper Palin look on during day three of the Republican National Convention. Palin's husband Todd Palin and Bristol's boyfriend Levi Johnston are also pictured on the right. Sarah Palin has not been afraid to emphasize that her oldest son Track has joined the Army and will soon be sent to Iraq. While commentators have questioned her ethics for trying to use her son’s military service for political advantage, there are now concerns Gov. Palin may have also concealed the true reason behind her son’s hasty enlistment, something which would put him in a less than flattering light. There are now allegations that her son Track was involved in a vandalism rampage a couple of years earlier and that his run-in with the law contributed to his decision to enlist in the Army. On December 5, 2005, the Mat-Su Valley Frontiersman reported that Alaska State Troopers had arrested four teenage boys for the previous week’s vandalism of school buses. The boys deflated the tires of 44 buses, broke mirrors and unplugged 110 buses from their engine-block heaters, which caused the buses not to start in subzero weather. The incident was serious enough to force the school district to close schools for a day on November 29. However, adversaries of Sarah Palin need not bid on the event (with the $25,000 minimum opening bid) listed on eBay, as Palin is unlikely to grant her approval or agree to show up and meet with the winner(s) of the dinner … (Keith Olbermann, Jon Stewart and David Letterman are probably out of the running). Just a thought, but could this be some publicist’s weak attempt at improving Sarah Palin’s fading reputation on the backs of wounded military personnel and her son Track Palin? How would you like to have dinner with Sarah Palin? This is the chance of a lifetime to experience an evening with Governor Sarah Palin. The former Vice Presidential candidate and Governor of Alaska was selected as one of America’s “Top 10 Most Fascinating People” of 2008 for a Barbara Walters ABC special in December 2008. Her oldest son Track enlisted in the U.S. Army on September 11, 2007, and was subsequently assigned to an infantry brigade. He and his unit deployed to Iraq in September 2008 for 12 months. She is, quite simply, one of the most talked about people in the US, and she and Todd will sit down with you and up to four of your friends for dinner. The opening bid is $25,000. A background check for all attendees is mandatory. Failure to pass the background check will result in the winner forfeiting the experience and a refund given. The dinner experience with Sarah Palin will take place at a site to determined at a mutually agreed upon time and date to be determined by Ms. Palin and the winning bidder. Ms Palin may bring up to three guests of her own. The dinner will be paid for by the seller. There are no age restrictions but anyone under 16-years-old must be accompanied by a parent or legal guardian. Winner may take personal photos and allowed to bring one item of reasonable size i.e. no larger than what can be carried by hand (t-shirts, books, magazines, etc.) The decision to sign the item will ultimately be up to Ms. Palin. Respect for Ms. Palin and her guest(s) is expected at all times. Inappropriate behavior will result in the conclusion of the experience with no refund. Dinner shall last no more than four hours, but could be less, in the sole discretion of Sarah Palin. * Governor Palin reserves the right to refuse dinner with a winning bidder if, in her sole discretion, the winning bidder is not a suitable bidder based on her subjective standards of suitability, professionalism, background and other factors. In the event the high bidder is rejected for this reason, the high bidder’s bid will be refunded, if paid, and the next highest bidder shall be notified, and thereafter, until a suitable match is determined. Levi Johnston is in the middle of a public relations blitz. And what Levi and his handlers are doing is trying to turn a bad situation into a net positive for the 19-year-old from Wasilla who knocked up the wrong girl at the wrong time. Now the plans include red carpet events in Los Angeles, acting in films, perhaps a reality show. Track Palin will make a stop in Kuwait where his mother, Sarah Palin visited troops, before beginning his service in Iraq. The eldest son of Alaskan governor and Republican Vice Presidential nominee Sarah Palin was deployed to serve the United States in Iraq earlier this week. Exactly one year after enlisting in the United States Army, Track Palin flew to Kuwait on the seventh anniversary of the attacks of 9/11. Recently, however, rumors have arisen as to Track Palin’s motivation for joining the United States Army. It was reported Monday by the 1080 KUDO radio station out of Anchorage that Track Palin was involved in a 2005 school bus vandalization in Wasilla, Alaska, Governor Palin’s hometown.